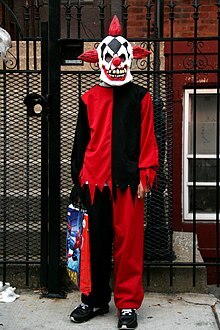 A person dressed as an evil clown in 2007. The 2016 clown sightings were reports of people disguised as evil clowns in incongruous settings, such as near forests and schools. The incidents were reported in the United States, Canada, and subsequently in other countries and territories from August 2016. The sightings were first reported in South Carolina when a 9-year-old boy told his mother that two suspicious males dressed as clowns tried to lure him into the nearby woods. By mid-October 2016, clown sightings and attacks had been reported in nearly all U.S. states, 9 out of 13 provinces and territories of Canada, and 18 other countries. Prior to the spate of incidents in 2016, numerous sightings of people dressed as clowns in odd or incongruous settings have occurred throughout the world since 2013. The proliferation of videos and images of these precursor sightings spread through social media posts and viral sharing of the content, most notably from DM Pranks, a YouTube user from Perugia, Italy. While most of the 2016 incidents appeared to be wholly unsubstantiated or lacked evidence of criminal activity (with many incidents being deemed practical jokes), a few led to arrests. Some people were cited or arrested for making violent threats to schools, and some incidents involved robberies and assaults on children and adults. By mid-October 2016, in the wake of hundreds of "clown sightings" in the United States and Canada, the phenomenon had spread from North America to Europe, Israel, Australia, New Zealand, Singapore, and South America. One possible precursor event was the 2013 sightings of a "creepy clown" in Northampton, England. The Northampton clown sightings, which were in the town during September and October 2013, were the work of three local filmmakers Alex Powell, Elliot Simpson, and Luke Ubanski. The clown shared similar looks to Pennywise the Dancing Clown from Stephen King's book It. The trio started a Facebook page for the so-called "Northampton clown" and were using the appearances to drive traffic to the page. In March 2014, Matteo Moroni from Perugia, Italy, owner of the YouTube channel DM Pranks, began dressing up as an evil clown and terrifying unsuspecting passersby, with his videos racking up hundreds of millions of views. A rash of sightings appeared in California in October 2014, which centered around the "Wasco clown", and primarily occurred in the Wasco, California, area with photos appearing on social media. A person in clown attire was spotted in a cemetery in Chicago, Illinois, in July 2015. This occurrence involved two residents who spotted the "creepy clown" scaling the gate at the Rosehill Cemetery late at night. After the clown entered the cemetery, they turned to face the residents and began waving slowly as they made a video recording. After waving for a few seconds, the clown ran into a dark wooded area and was not seen again. Police investigation of the sighting did not lead to any arrests. The 2016 clown phenomenon began in Greenville, South Carolina, in early August, followed by incidents in Canada shortly afterward. It later spread around the U.S. In early October 2016, further incidents were reported in Canada and the first occurrences in the United Kingdom and Australia. British communities were described as "horrified" and pressure had been placed on police resources. Throughout this time, Internet social media sites received numerous postings related to the phenomenon. The World Clown Association president Randy Christensen took a stance against the current trend of people dressing up as clowns to frighten people.Circuses and other clown-related businesses were affected. In October 2016, McDonald's decided that Ronald McDonald would keep a lower profile as a result of the incidents. A sociologist has called 2016 "a bad time to be a professional clown". The killer clown craze has been linked to a significant increase in sales of clown suits in and near Glasgow, Scotland. During Halloween, some Floridians decided to go armed while trick-or-treating. On October 12, the Russian Embassy in London issued a warning for Russian and British citizens because of the clown scare. On October 13, Fijian police warned people against involvement in the events. By October 25, 2016, several news outlets reported on an alleged clown-initiated "purge" or "attack", which supposedly was to take place on Halloween Eve of 2016. While there were no widespread "purge" attacks as threatened, a family from Florida were attacked on October 31, 2016 by a group of approximately 20 people in clown masks (and masks styled after The Purge movie). No arrests were made. The sightings inspired the upcoming horror film titled Behind the Sightings, directed by Tony Cadwell. On October 7, several of these sightings were reported in Campbelltown, New South Wales. Four images of sightings in the city were uploaded onto the Internet and one showed a clown being knocked to the ground. Since October 7, there have been multiple sightings across major Australian cities, which include Sydney, Melbourne, Brisbane, Adelaide, and Perth. On October 8, at around 9:30 PM, two 12-year-old girls were with one of their fathers buying ice cream when suddenly, they were attacked by a creepy clown in Adelaide's CBD (Central Business District) near the intersection of Pultney Street and Rundle Street. While attacking the girls, the clown tried to steal one of the girls' phone. In October, a sighting was recorded in Curitiba. The incidents in Brazil and worldwide led to professional clowns protesting in Rio Grande do Sul in late October. On October 5, in Edmonton, Harry Ainlay High School was put into lock down due to clown scares on social media. The following day, other incidents in the city were reported at a Catholic school and junior high schools. As well, two incidents of sightings occurred in Fort Saskatchewan, a city direct northeast of Edmonton. Later, a 15-year-old youth admitted dressing up as one of the clowns to RCMP in Fort Saskatchewan. Elsewhere in the province, the Calgary Police Service received messages from several Calgarians regarding images depicting people dressed as clowns in the city. On October 6, two teenaged boys dressed as clowns were placed under arrest, following a threat which made schools in the Prince George area be locked down. The teenagers, aged 16 and 17, were arrested at a high school in the area. Police are investigating several encounters with creepy clowns in New Brunswick communities. A person dressed as a clown was seen trying to jump out in front of cars in Ripples. A complaint about a "creepy clown" sighting was received by local authorities, prompting an investigation in Gander, central Newfoundland. In early October, people dressed as clowns were sighted in Halifax, Hammonds Plains, and Dartmouth, Nova Scotia. Police responded to a sighting at Halifax West High School. People dressed as clowns in Glace Bay have also interfered with traffic. Police in Clark's Harbour arrested a 24-year-old man wearing a clown mask. Witnesses reported that he grabbed at the clothing of a young boy. In the first half of October, there were several reports of people dressed as clowns in the hamlet of Rankin Inlet, Nunavut. In early October, people dressed as clowns were spotted chasing children during dismissal at Pope Francis Catholic School, an elementary school in Toronto. Police detained two 15-year-olds in connection with the incident. It is believed they are former students of the school and they were filming their activities for a YouTube video. Police have said that the suspects did not touch the students. In addition, the Toronto Catholic District School Board spokesperson John Yan said that a group named "Clowns in the 6" have specifically named different high schools in Toronto as targets for potential clown attacks. On October 6, 2016, a group of people dressed as clowns made a message on an Instagram account saying: "We are coming to London, Ontario's high schools and surrounding areas. We are going to kidnap students and behead teachers, we're not clowning around." The account gained attention in the city of London as well as Saint Thomas and surrounding towns and municipalities. A few days later, a student at Mother Teresa Catholic Secondary School in North London was approached by a man wearing a clown costume. The man sprinted at her, coming close to the school itself. Numerous students captured photos on the social media application Snapchat, as the man ran from the property. Clarke Road Secondary School and H.B. Beal Secondary School were both put under lock-downs during the following days. During the height of this "clown epidemic", London District Catholic School Board banned students from wearing clown costumes during Halloween celebrations that year. On August 9, people dressed as clowns were reported to have been chasing children in Gatineau, Quebec. On October 2, a video surfaced of a person dressed as a clown in the middle of a dirt road in Quebec, with a chainsaw that chased after a car on foot. On October 14, in Montreal, a teenager was chased by a clown with a baseball bat; he called the police, but the culprit was never found. In October, a male dressed as a clown was filmed walking around with a baseball bat in Rancagua, Cachapoal Province, pursuing the recorder and his group of friends. Sightings in Croatia begun on October 16 in Osijek, then followed in other cities, such as Karlovac and Trilj. Some teenagers allegedly beat a person dressed as a clown in Osijek and on October 21, the first three people dressed as clowns were arrested in Karlovac. On October 22, another person dressed as a clown was arrested in Varaždin. Croatian minister of interior affairs Vlaho Orepić said in an interview for RTL TV that Croatian police would deal with that issue and ensure safety of citizens. Police districts across the country have received 22 reports of sightings in total by October 17, 2016. On October 12, 2016, a man was driving home from a football match when he spotted an axe-wielding male dressed as a clown standing in the middle of the road. The man nearly hit the clown, who was later revealed to be a 13-year-old boy. On October 14, a man in Holbæk was followed by a male dressed as a clown. He managed to punch the clown in the face. Police stated that both parties risked prosecution. On October 18, there were two sightings of people dressed as clowns in Tuusula. First, around 10 people dressed as clowns jumped out of a grey van at the playyard of school. They started to hunt down three kids who escaped to an underpass, where another clown was waiting with a chainsaw. Later, two adults with white overalls and pig masks were running behind at least one child and scared teenagers. On the evening of 22 October in the Kallio district of Helsinki, two clowns jumped in front of a 30-year-old man, who was jogging with his dog. The dog bit one and the man punched another of the clowns. However, the clowns managed to escape. The man made a police report of the incident, and the police did not find the suspects. There were also sightings of people dressed as clowns in Turku, Luvia, Vaasa, Rovaniemi, Porvoo, Espoo, Vantaa, Nurmijärvi, Kotka, Rauma, Riihimäki, Savonlinna, Oulu, Kerimäki, Pieksämäki, Varkaus and Leppävirta. On October 15, at 2:00 AM in Wesel, two men reported a man in a clown mask carrying a knife and gun. On October 21, people dressed as clowns were reported in two northern German towns. One wielding a baseball bat in the city of Rostock attacked a man, leaving him with bruises. Another in the same town threatened a 15-year-old with a knife. In nearby Greifswald, two separate reports involved a clown wielding a chain saw. Two other incidents in Greifswald involved young children being scared by someone dressed as a clown. On October 25, a 16-year-old masked as a clown was stabbed with a knife by a 14-year-old in Berlin. The 16-year-old had to undergo surgery. On October 29, the German Interior Ministry announced a "zero-tolerance policy" against creepy clown attire ahead of Halloween. It was reported that over the past several weeks in Germany, there had been 30 reports of incidents involving attacks, robberies, or assaults. There were many reports of incidents regarding people dressed as clowns, but no arrests were made. On 10 October 2016, organizers of a Halloween haunted house attraction apologised after three people dressed as evil clowns and carrying imitation chainsaws frightened students in the grounds of Newpark Comprehensive School in Blackrock, Dublin. The clowns were said to be publicising the attraction and unaware that the grounds were private property. The attraction's spokesperson said it was "'in no way linked' to the 'creepy clown' craze sweeping across the UK and US". After the incident police said they are taking the clown craze seriously and reports will be investigated. After the statement it was reported that a clown with an axe broke into a home in County Kildare, and scared a child. There were reports of clowns jumping out of bushes to scare schoolchildren. In mid October Dundalk police issued a warning saying "A number of people have been hurt as part of this craze and we are advising people not to take part in it" and that "It could be considered a breach of the Public Order Act or the Offences Against the Person Act." On October 5, residents of Monterrey, Nuevo León made warnings on Facebook that thieves dressing as clowns were present in the area. The Facebook group's alert said that the clowns assaulted a passersby, who were walking home. On the early morning of October 7, several news sources reported that two males dressed as clowns were found dead in Ecatepec, a suburb of Mexico City, possibly due to being beaten to death by a group of people after the clowns were scaring people. This turned out to be false. The news sites reporting the incident used a photo of two clowns murdered in Guatemala in March 2015. Sightings were reported in several New Zealand cities, such as in Auckland where a creepy clown was caught on camera at the University of Auckland library. A man dressed as a clown was arrested in Dunedin for scaring passersby. Four people dressed as clowns stood outside a teenager's home, threatening to kill her. In the first half of October, a woman was attacked by two people dressed as clowns. In the second half of October, a person dressed as a clown stole a box of beer and handed it to a bicycling accomplice. A woman's three sons were playing basketball at Discovery School in Porirua and one of the sons was approached by a person dressed as a clown. The mother then called the police. A police spokesperson urged for the community to be calm. In mid-October 2016, a male wearing a clown mask was a tyre-slashing suspect in Timaru. On October 10, various incidents were reported of a person dressed as a clown wielding a knife chasing and scaring children in Almere Buiten. The police have started an official investigation to find the person responsible and have publicly requested that they identify themselves and to stop causing public unrest. A person dressed as a clown was sighted in Ruwaard on October 10 and 11. On October 14, a 17-year-old boy dressed as a clown was arrested in Roermond, Limburg for jumping towards drivers and scaring them. On October 11, in Bodø, two youths wearing clown masks were wielding bats and sticks and scaring people. The two turned themselves in to authorities later that night. In Eidsvåg, a sighting was reported at a petrol station. On October 29, a 19-year-old man filmed himself dressed up as a creepy clown and jumping out towards people. The next day, the man was detained by Singapore Police at his home and taken to a police station for questioning for several hours. It was the first known and only reported clown scare incident in Asia. In mid-October, a person dressed as a creepy clown was filmed standing near a road in Lleida. Also, some sightings were reported in Paterna (Valencian Community). The City Council called for calm and issued guidelines for neighbors to know how to act. On October 28, a case was reported in Madrid Metro, in Loranca Station (Fuenlabrada), when a young girl was assailed by two people dressed as clowns. Since the week starting October 10, sightings have been reported in numerous cities: Stockholm, Malmö, Timrå, Ronneby, Linköping, Mjölby, and Falun. On October 12, a person in the clown mask stabbed a 19-year-old boy with a knife in his shoulder in Tvååker. On October 13, a woman in Skänninge reported that she was threatened by a pair of clowns armed with knives. The following day, a man in Varberg was injured by a knifeman wearing a clown mask. By mid-October, Swedish police were reportedly "overwhelmed" as a result of emergency calls due to clown sightings and incidents taking place across the country. On October 13, Swedish Interior Minister, Anders Ygeman, urged Swedes not to join in the clown craze. In the third week of October, at least three sightings were reported in Zürich. One was reported to be violent, in which a person wearing a clown mask punched a person in the stomach. Northumbria Police stated that 6 reports have been made about clown incidents since the beginning of October. Although nobody was attacked during those incidents, some of the reports involve clowns in Newcastle upon Tyne jumping out of bushes to frighten children with other reports of clowns chasing people. On October 4, a teenage boy in Blakelaw, Newcastle upon Tyne, was placed under arrest as a suspect in a clown-themed "prank". On October 7, a masked man with a painted face and carrying a knife, jumped out and chased two students, aged 11 and 12, who were on their way to Hermitage Academy in Chester-le-Street, County Durham, leaving the two students distressed, but unhurt. Durham Constabulary said it was investigating the incident. That same night, a man in Plymouth, South West England, was confronted by a clown with a hammer while walking home from a Tesco supermarket. The clown stood in front of the man, blocking his path and then refused to move when asked, before the man chased the clown away. Devon and Cornwall Police were investigating the incident. On October 9, a 30-year-old man dressed as a clown was arrested after chasing a woman through Eaton Park in Norwich, East Anglia. On October 10, a gang of three people dressed as clowns were spotted in Welwyn Garden City, Hertfordshire. Kent Police reported there had been 59 clown-related incidents between October 7 and 10. On 11 October a teenage boy was hospitalized for a cut to his head after a clown threw a log at him in an alleyway in Dinnington, South Yorkshire, near Rotherham. South Yorkshire Police launched an investigation into the attack. On October 12, a tradesman in Blackburn, Lancashire apparently tackled a knife-wielding man dressed as a clown and suffered serious hand injuries. The clown was said to have had a green wig and was wearing a "silky green tracksuit with yellow lines down the sleeves and long, Gothic black boots." It was later revealed to be a hoax – the man had simply fallen on broken glass and fabricated the clown attack. He was prosecuted for wasting the time of Lancashire Police. Over a weekend, in mid-October, the Thames Valley Police were called to 14 incidents in less than 24 hours. According to Police Scotland, there have been several reports about people dressed as clowns intimidating the public. A former X Factor contestant claimed to be chased by a "killer clown" in possession of a baseball bat outside a nightclub in Aberdeen. "Killer clowns" sightings in Dunbar caused traffic jams and were apparently chasing after children. A clown was spotted and filmed crossing a road near the town's Asda supermarket. "Killer clowns" have been jumping out of bushes to scare pedestrians in Perth and Dundee. A man walking his dog spotted a "killer clown" near a primary school in Motherwell. The clown ran away after it was revealed that he is scared of dogs, as it is clear in the video that the man filmed. 10-year-old children living in Inverness reported seeing a "killer clown" at a play park who was armed with an unknown weapon. One of the children ran home, leaving her scooter behind. Her older sister, along with her boyfriend, went back to the play park to get the scooter but it was gone, realising that the clown had stolen it. On 27 October 2016, "killer clowns" were spotted at two schools in Livingston and one school in Bathgate. Pupils at schools in Livingston were locked into classrooms, fearing a break-in from the clowns. On October 5, a boy filmed a person dressed as a clown scaring passing drivers in Caernarfon. On October 7, a 10-year-old schoolboy in Tredegar, South Wales was left with a large bruise after a stone was thrown at him by someone dressed in a clown costume. A person dressed as a clown who was seen frightening people in the street in Rhyl, who was stopped by police, was revealed to be a wanted man, and another person dressed as a clown was also seen in Merthyr. On October 10, a girl aged 10 in Bridgend was left scared when four people, wearing clown masks and carrying a "sledgehammer", approached her in a park. That same night, Chief Inspector Paul Staniforth of Gwent Police said: "We've now received 18 reports of people dressed up as clowns throughout Gwent. Some of the reports have included clowns running through gardens and peering through windows, lurking around shopping centres, parks and schools and jumping from trees." On October 5, a number of people dressed as clowns were spotted in Belfast. On October 7, a school in Coleraine had closed its doors for a short time because of fears that people dressed as clowns were on their way to the school. On 7 October a clown threatened children with a knife in Riverside Park, Ballymoney, County Antrim. On Instagram an account called 'killerclownsballymoney' said a clown would be "waiting at Ballymoney High school gates at 3:55 and on Mondays it'll be Dalriada at 2:40". On social media, an image appeared of a clown stood outside Cullybackey College in the village of Cullybackey The police released a video in which they urged people not to participate in the craze and said they faced the possibility of being arrested. On October 12, Holy Trinity College, Cookstown, County Tyrone was locked down after a threat on social media, police officers were deployed to the school and the front gate was closed. UUP politician Trevor Wilson condemned the threat. By mid October 10 children had received NSPCC counselling over fears of the clowns. A school in Ballycastle, County Antrim banned the wearing of clown costumes to a Halloween party taking place during school. Three people dressed as clowns were arrested by police after they scared people in Mullacreevie Park, County Armagh. After originally occurring in South Carolina, the sightings and threats spread to more than four-fifths of the country's states, the District of Columbia, and the territory of Puerto Rico. In the second and third weeks of September, a total of 9 people were arrested across Alabama for threats. Seven of them faced felony charges. A 14-year-old was arrested for a misdemeanor charge for threatening Rainbow Middle School in Rainbow City. Two teenage juveniles were arrested in Calhoun County, one for making threats to shoot up a Saks middle school, and the other for a charge of "child in need of supervision." In Escambia County, a 22-year-old woman and two juveniles were arrested on terroristic threat charges for a September 15 threat against a school. On October 8 and 9, a woman posted on Facebook that her daughter saw a clown near Floyd Dryden Middle School in Juneau and that on the night of October 10, her co-worker was chased while in her car by two clowns who were holding metal objects. Two 17-year-olds robbed a Phoenix Taco Bell and Domino's Pizza while wearing clown masks. Both of the alleged robbers were armed with weapons, and a gun was fired once during one of the robberies,[which?] but no one was injured. The two were arrested for robbery. People dressed as clowns were reported in Lowell near the elementary schools. A person dressed as a clown was arrested in Downtown Bentonville, Arkansas on October 5, 2016. On October 4, people dressed as clowns threatened Fairfield, Sacramento, and Vallejo public school campuses. A clown sighting was reported in Temecula. On October 5, a person dressed as a clown was accused of trying to kidnap a 1-year-old child from his mother in Concord. No arrests have been made. That same night, in the Los Angeles County city of Lancaster, three incidents of groups of people wearing clown masks and possibly armed with kitchen knives were reported to the police. In San Pedro, Los Angeles, two clowns were spotted by employees at Taper Avenue Elementary School & Technology Magnet. One clown allegedly had the writing "killer" printed on his mask. In Northridge, Los Angeles, at California State University, Northridge, two students were chased down by a lone clown in the campus. A 14-year-old from Fontana was arrested for making clown-related threats towards schools. On October 6, people dressed as clowns were spotted at multiple schools including ones in Moreno Valley, Sacramento, and Beaumont. One clown allegedly walked around the school campus with a sign that read "WEARECOMINGTOCALI." The Huntington Beach Police Department received reports of two separate clown sightings in Huntington Beach: one near a community park and two near a shopping center. On the same day, the Rohnert Park Department of Public Safety launched an investigation in response to nine clown sightings being reported in the city in the past few days. In nearby Santa Rosa, the Santa Rosa City Schools worked with the Santa Rosa Police Department to investigate clown-related threats made to the district's schools, which were apparently hoaxes. Social media reports of potential clown-related activity in the Bay Area's Antioch and Oakland schools lead to investigations by city police investigations. Schools in Pittsburg banned students from wearing any makeup for Halloween due to the clown scare. The Marysville police arrested a juvenile on a felony charge for making clown-related threats of shooting people at Yuba County schools. An 11-year-old boy from Salinas was cited for cyberbullying on October 8 for making clown threats towards Alisal Elementary School District schools. On October 10, a "creepy clown" was spotted and photographed on a MUNI bus in San Francisco; the clown flipped off the photographer after she took the photo. On October 16, a person dressed as a clown holding a knife approached a man sitting on his porch outside his house in Santa Clarita, and the home owner fired a gun in the air, scaring the clown. A person dressed as a clown was arrested by Los Angeles County Sheriff's Department deputies for possession of burglary tools, although the department speculated that the clown arrested was not connected to the one who was holding the knife. The home owner was taken into custody after deputies found drugs and firearms in his home. On October 23, sightings of a suspect dressed as a clown in UC Davis's West Village Apartment complex were reported to the police. Media coverage and police bulletins publicized the suspect as wielding an unidentifiable weapon and harassing residents. On September 30, in Denver, a student reported to the police that a person dressed as a clown grabbed her. In late September, clown-related threats of violence were made to Jefferson County School District, Poudre High School, Palisade High School, Grand Junction High School, Northridge High School. On October 6, an altercation occurred between a clown and a man at the Pikes Peak Greenway Trail in Colorado Springs. The man allegedly asked the clown to identify himself, who refused to do so, and the man punched the clown in the face. The clown then allegedly hit a bottle of whiskey over the man's head, resulting in him bleeding. No arrests have been made in the case. New Haven High schools, such as Eli Whitney, Wilbur Cross, Co-Op, and James Hillhouse, were threatened by "Jackson the Clown" on social media. Two girls were later arrested for the threats. On October 13, New Britain High School was placed on lock down following a clown-related incident at the school. A 35-year-old woman and a 39-year-old man were arrested for a breach of peace, and were driving in a car with clown masks and blaring loud music. In October 2016, 2 juvenile girls in Naugatuck were charged in connection with making online threats involving "scary clowns". Also in October 2016, Meriden saw a rash of scary clown sightings and incidents. The Delaware State Police and University of Delaware Police received reports of clown sightings. Two high school students in Smyrna were arrested and charged with felony terroristic threatening and conspiracy after making threats of clowns committing violence against other students on Instagram. The high school was evacuated and an explosive detection K9 team swept and cleared the building. Numerous reports of sightings have been received by the Indian River County Sheriff's Office. In Indian River County, on September 28, while walking her dog, a woman reported seeing a person in a clown costume come out from behind a tree. The person was dressed in a white clown costume, wore a mask, and had red hair. On September 28, a group of classmates in the Vero Lake Estates area were chased by someone in a clown mask after getting off a bus. A woman near Victoria Park reported sighting two people dressed as clowns staring at her. Police alerted agencies in the surrounding area. They also conducted a search of railroad tracks and forest areas near U.S. highway 1, but were unable to find them. Numerous Floridian schools were also put under lock down due to the scare. Additionally, threats arose on social media from people masquerading as clowns, where they threaten to cause a school shooting. One of these "killer clowns" was discovered to be a 12-year-old boy, who said he was going to kill students at Pasco County schools and was subsequently arrested. On October 15, two men, ages 18 and 20, were involved in two incidents in Melbourne where they dressed as clowns and chased people while carrying an ax and a baseball bat. They were also involved with a third incident on October 20. In one of the incidents, one of the clowns was reported to have jumped in front of a person and threaten to kill him or her. On October 27, they were arrested and one was charged with assault and the other was charged with principal in the first degree. On October 23, a 26-year-old Mount Dora man was arrested for illegally possessing a rifle with a scratched out serial number. The man had a clown mask, and ran from Lake County deputies, which resulted in a physical altercation. Some parents said they would be arming themselves on Halloween night to protect their children. On Halloween night, a group of about 20 people in clown masks and masks from the movie The Purge, allegedly attacked two people who were checking their cars in Orange County. One man was stabbed and injured, and another was assaulted with a hockey stick. The LaGrange Police Department received reports of people dressed as clowns in a van luring children on September 12. Two people were later arrested for falsely reporting a clown sighting, and four were arrested for making a "terroristic threat" involving clown costumes. Dublin Police Chief Tim Chatman stated that an individual involved in a car accident reported seeing a clown and swerved to avoid the clown, although no one saw a clown at the time of the incident. On October 6, an Instagram post by a group of people dressed as clowns threatened violence to Wai'anae Intermediate, a school in Wai'anae. The U.S. Army Garrison-Hawaii was also involved. In early October, reports of people dressed as clowns walking around school campuses and around streets, some armed with metal weapons, were made in eastern Idaho, including Blackfoot. On October 4, multiple students at Greenwood Elementary School reported that three people dressed as clowns, one with a briefcase, one with a handgun, and one with a knife, stood on the edge of the school's property and threatened the students. The people dressed as clowns reportedly made threats to the students, and fled in an SUV. The incident is being investigated by the Waukegan Police Department. A call to the Waukegan Police Department responded in a report that the children were found out to have made it up. On October 11, an 18-year-old man with a clown mask was arrested for allegedly chasing two people with a metal baseball bat in Urbandale. On September 27, 2016, a person dressed as a clown was spotted creeping in the bushes near the intersection of 85th Street and Parallel Parkway in Kansas City, Kansas. On October 1, 2016, in Topeka, a clown was spotted near the intersection of Southeast 37th Street and Southeast Adams Street. Again in Topeka, a few days later on the morning of October 4, 2016, children waiting at a bus stop in the 2400 block of Southeast Colonial Drive witnessed a clown with a knife chasing a 13-year-old girl; however, by the time police arrived, the clown disappeared and was not seen again. During the day of October 4, in nearby Lawrence several people reported seeing clowns lurking around the University of Kansas campus, with many witnesses posting photos to social media. The clown sightings caused one sorority to go into lockdown. People dressed as clowns were also spotted in Lawrence near Free State High School, however upon investigation, those clowns were found to be harmless and were merely waving at passing cars. Reports of clowns have also been made in the Kansas cities of Chanute, Pittsburg, and Parsons; however the Parsons report was later revealed to be a hoax. On September 23, 20-year-old Jonathan Martin was arrested for wearing a hood or mask in a public place, disorderly conduct and two outstanding warrants for non-payment of fines and failure to appear in court. Martin was found in a full clown costume, lurking in wooded area near a Kentucky apartment block. On October 1, a woman reported that while she was walking on a trail at night, a clown came out of the woods, assaulted her and attempted to drag her into the woods. Officials reported that the woman was able to fight the clown off and escape, while also stating that this is the first clown sighting in Clark County. On the same day, a man in Bardstown mistook a woman wearing a white afghan out walking her dog for a clown and fired a warning shot with an AR-15 to scare her. Throughout the month of September police received multiple reports of "creepy clown" in both Bowling Green and Glasgow. In late September in Louisville there were multiple reports to police stating that 5 to 6 people wearing clown costumes were sighted cruising around the downtown area at night in a white van. On October 15, a 21-year-old man was arrested after an incident in Rosepine of him wearing a clown mask and brandishing a gun at drivers, while he was driving his car. On October 4, a person dressed as a clown was reported to have stood in an Orono neighborhood for approximately 15 minutes. There have also been sightings in Standish, Bangor, Kennebunk, Gorham Porter, Portland, Saco, Waterboro and Wells. In October, clown-themed accounts through different social media outlets began sending out threats to shoot PGCPS county schools. Additionally, four students from Rosa Parks Middle School were arrested for making similar threats to two other middle schools in MCPS. On October 3, Monday night, students at Merrimack College were briefly told to shelter in place and a residence hall was evacuated after someone reported an armed clown on campus. Police at Emmanuel College received an “inundation of calls” of sightings on campus shortly after midnight Tuesday. A similar incident was reported at UMass Amherst the same Monday night, as well as additional reports in Lowell and other various localities. At 2:11 AM, on September 22, a person dressed as a clown was reported to police by a Vermontville man. The clown was seen walking on M-79 highway in Nashville. At 6:30 am on October 4 Middle School Students waiting at a bus stop in Allegan County, MI saw a clown emerge from a woods, run towards some other students, then disappear into the woods. At 3 am in the early morning of October 2, 2016, 17-year-old Chris Henckel spotted a clown standing at a car wash in Clinton Township, a suburb of Detroit, while driving through the area with friends. While Henckel was not approached or harmed by the clown, he says that it attempted to follow his car. Henckel posted a video of the encounter on Twitter, where it went viral. Clinton Township police declined to investigate the incident, as Henckel was unharmed and they have not received any reports or complaints of strange clowns in the area. Henckel said he drove by the carwash multiple times afterwards in an attempt to find the clown again, but it has not reappeared. Two days later, on October 4, 2016, two attacks were reported in Sterling Heights, another Detroit suburb in close vicinity to Clinton Township. In the first incident, a 7-year-old boy was approached outside of his home at 6:50 pm by a person of an unspecified gender with "red hair, a red nose and red facial features" wielding a sharp object; the clown scratched the boy's arm with the object then fled, the boy only suffering a minor injury. Later that night at 8:30 pm, two women walking reported being approached by three adult males in clown masks, one of which was wielding a baseball bat, who screamed obscenities, hit the bat against an adjacent fence and then ran away. Sterling Heights police are investigating both incidents and are seeking help from the public. On the same day, the police department of the Detroit suburb of Troy, which borders Sterling Heights, issued a notice that any clowns spotted trespassing at schools or on any private property will be automatically arrested and detained. The notice came after reports of clowns being spotted at area schools during classroom hours, as well as clown-related threats being made to area schools on Twitter. They also stated concern for the safety of the clowns, who they fear could be harmed by frightened civilians who may attempt to defend themselves. Also on October 6, two 14-year-old girls were terrorized by two teenage women dressed as clowns, who jumped out of a car and chased them. In a press release after their arrest, the Roseville police chief referred to them as "morons" and "idiots". A 15-year-old girl from Bloomington created a "Kroacky Klown" Facebook profile and made threats to "kill" in Bloomington and other cities. After police interviewed the girl, she explained she created the profile on her younger sister's phone to scare her boyfriend but "the situation got out of control and went viral," police said. On September 21, in Tchula, Police Chief reported seeing a clown wearing a multi-colored wig, overalls, and a mask carrying what appeared to be a machete. Upon seeing the police car, the clown fled. His or her whereabouts remain unknown. One driver reported seeing a person dressed as a clown lurking around by Republic High School during the night in Republic, Missouri. People dressed as clowns have also been sighted in Platte City, Joplin and Neosho, Missouri. Clown related threats were also made in Blue Springs, Missouri. Clown sightings have also been reported in Clinton, Versailles and University of Missouri campus. On October 12, a 15-year-old boy was cited for disorderly conduct for an alleged October 5 threat posted on Facebook. The threat was about a clown killing students at Missoula schools. In early October, people dressed as clowns were spotted in Lincoln and Grand Island. On October 5, four teenage clowns were arrested for terroristic threats in Grand Island. One was in possession of a BB gun. In Sparks, three men were chased by a suspicious man, dressed like a clown wielding a machete near the Shadow Mountain Sports Complex. But then turned out to be fake and set up by the same three men who supposedly saw the clown. In Durham, New Hampshire, UNH College Students (University of New Hampshire) reported to the police that a person dressed as a creepy clown was roaming the campus. Police followed up the report claiming that the clown was found with no weapons except a megaphone. It is unknown why the clown had a megaphone. On Monday, October 4, at around 10pm, a male in a clown mask carrying a plastic machete scared a woman at a Quick Chek convenience store in Parsippany. A second eyewitness also was scared by the same individual who then ran away through a hole in the fence at the rear of the building. Police officials were unable to locate the suspect initially, however they later identified the individual as a juvenile. Police officials stated that this was a misguided prank and was ultimately harmless. In Phillipsburg, New Jersey, a boy claimed to have been chased by a clown with a sword. The boy says that he heard the clown say "I'm gonna get cha". People dressed as clowns were also spotted in Bound Brook, Hunterdon, Monroe, North Plainfield, Trenton, and Spotswood. A middle school student from Cinnaminson was detained for harassing students in a clown costume. In the first week of October, police in Hobbs received multiple reports of clown sightings. No arrests have yet been made. In the second week of October, there were reports of clowns armed with baseball bats walking around Roswell. On October 9, three juveniles with clown masks were arrested outside a children's clothing store in Albuquerque. They were found in possession of a firearm. On September 28 and 29, sightings were reported in Brentwood and North Babylon on Long Island. The North Babylon School District and Shenendehowa School District went on "lockout" the following day, and the Lindenhurst School District employed precautions. A "lockout" means that nobody is allowed to enter or leave during class hours. A Twitter account called "Suffolk Clowns" (@LIClowns) emerged, making (possibly joking) threats to numerous school districts and posting pictures of clowns. However, the account has since been suspended. After a sighting at St. Bonaventure University, school officials issued a statement on October 5 requesting that students not take matters into their own hands when confronting potentially dangerous situations. Reports say that students had created a sign-up sheet for an "Anti-Clown Army" and students were later seen roaming the campus armed with baseball bats. On September 4, children in a Winston-Salem neighborhood reported to the police about a person dressed as a clown trying to lure them into some woods. They described him as wearing white overalls and gloves, red shoes, and bushy, red hair. His face was described as white with a red nose. They claim that he offered them treats if they would go with him. According to police, an adult heard, but did not see, the clown. On September 7, a witness reported seeing a person wearing a scary clown mask, red curly wig, yellow dotted shirt, blue clown pants and clown shoes exited the woods by an apartment complex around 10 a.m. in Greensboro, although the clown disappeared after another witness attempted to chase down the clown with a machete. On October 10, police in Rolla received reports of a person dressed as a clown armed with a machete. On September 27, at about 2 am, a woman called Lancaster police and reported that she had seen a clown with a large kitchen knife in its hand. Witnesses at the location told police that they had seen two clowns, one wearing a gold suit with balloon and the other wearing all black. Police failed to find them. On September 29, a woman was attacked while on her porch while she was smoking. She claimed that a man dressed as a clown grabbed her throat and said "I should just kill you now..." The victim also stated that he said that "some students and teachers would wish they were never born at the junior and senior high school today." That prompted Reading school superintendent Chuck LaFata to cancel Friday classes in the area, prompting local private school Mount Notre Dame to close as well. Also, a junior high student was arrested after making a clown-related threat using the Internet. On Sunday, October 2, a total of seven people were arrested in Cincinnati over clown-related threats. These students were charged with inciting panic for allegedly suggesting a "Clown Clan" descend on their schools. On October 4, a Speedway gas station in Dayton was robbed by three individuals, one wearing a surgical mask, one a Guy Fawkes mask and one a clown mask. In response to the various incidents, the sheriff of Darke County, Toby Spencer, posted a challenge to those who might consider pulling a clown prank, that "...as of today we have issued 6,125 (concealed carry) permits in Darke County alone. You might also ask yourself how your luck will be today." It was thought that clowns would visit a school in Lowellville which prompted a police investigation. There have been sightings in Oklahoma City, Moore, McAlester, Tulsa, and Chickasha, as well as Miami. On October 16, 2016 just outside the city limits of Pryor, Oklahoma a female motorist was reportedly attacked by two clowns after being flagged down by a woman posing as a motorist in need of assistance. She said the clowns forcibly dragged the motorist from her vehicle, choked her, extinguished a cigarette on her face, and wrote the words "clown posse" on her forehead. She later confessed to having made up the story and said she was responsible for her injuries. A woman reported on September 30 that a clown tried to break into her car near the O'Bryant Square in Portland. A man was arrested in Central Point on October 5 after posting pictures of himself dressed as a clown and trespassing at various local high schools. He was booked into the Jackson County Jail and faces charges of disorderly conduct and second-degree trespassing. On October 6, a 55-year-old man in a clown mask was arrested for menacing at Floyd Light Middle School in Portland. An assistant principal confronted the man, who then allegedly threatened to hurt him. The suspect is facing charges of menacing and disorderly conduct. There has been at least eight "scary clown" sightings, and police responding in some cases, in Douglas County since October 1, 2016. On September 18, 2016, in State College, a person dressed as a clown was seen acting strangely at the parking lot of a YMCA early in the morning. In late September, reports stated that an individual dressed as an angry clown was seen with a knife around the wooded areas behind Kistler Elementary School. Rumors of a clown threatening the Cumberland Valley school district have also been reported. York College students have reported numerous sightings on and off the campus. Both the Erie Police Department and the Pennsylvania State Police confirmed that in the city of Erie, there has been multiple clown sightings during the month of September. On September 25, 2016, 16-year-old Christian Torres was found stabbed to death on the front porch following a scuffle during a party in Reading when a man wearing a clown mask showed up at the party. The assailant, 29-year-old Avery Valentin-Bair was later arrested & charged with first degree murder. In October, a clown was arrested after threatening kids on their way to school in Whitehall, Allegheny County. On October 3, 2016, the Pennsylvania State Police issued a "Community Awareness Bulletin" which specifically addressed the reports that have been appearing in news and social media around the country. The general tone of the bulletin was cautionary, yet at the same time it reinforced the notion that many of the threats specific to clowns attacking schools had "not been validated". The bulletin also recalls the 1980s clown sightings in various US cities, as well as providing a phone number, email address and information about a smartphone app that citizens can use to report suspicious behavior to authorities. That same day the Bucks County Courier Times interviewed Joyce Meder, also known as "Bubbles the Clown" regarding the "creepy clown" phenomenon. Meder is an Abington, PA-based professional clown who provides entertainment for children. Describing herself as a "happy" and "fun" clown, Meder expressed disappointment over the recent clown scare, citing her newfound fears of possible run-ins with law enforcement when she is in public dressed as a clown. Meder goes on to say in the interview that she plans to turn to her colleagues in the professional clown community to "find out how they are being affected and what they're doing about this epidemic". After an alleged sighting at University Park, on October 3, Penn State students gathered together for a "clown hunt". Reports say that the number of students attended this hunt ranged from 500 to 1,000. Following the riot/hunt, the police stated that they did not believe that there were any actual clown sightings, but also stated that there was no property damage, no injury and no violence. At least ten cases of sightings were reported in Puerto Rico, including a clown being reported lurking around a Guaynabo home. On October 12, in Rio Piedras, a trio of clowns robbed a couple on a street. In the following week, a man reported in Rio Piedras that he was robbed at gunpoint by a clown and had his phone and cash stolen. On October 4, 2016, the Providence Journal reported that social media threats were made against Tolman High School and Goff Junior High in Pawtucket that prompted rumors of clown sightings. There was also reports of a clown with a machete chasing people out of Slater Park on three separate occasion and that a clown was seen hanging around schools in the same city. A teenage boy was arrested soon after for making threats against schools on social media involving clown masks. In Coventry, elementary school students had to spend their recess indoors after a social media post stated that a clown was going to appear at Hopkins Hill School. An overweight clown was spotted in Roger Williams Park. Although sightings were initially reported in South Carolina in mid-August, the phenomenon began to spread north from late August through the end of September. On August 21, 2016, there was an alleged clown sighting in Greenville at the Fleetwood Manor Apartment complex. Children in the complex reportedly witnessed clowns or a group of clowns attempting to whisper or talk to the children. The children told their parents that the clowns, equipped with "flashing green laser lights", said they lived in an abandoned house in the woods near a small lake. Greenville police came to the complex to investigate, and did find a trail in the woods leading to a house and a small lake, but no evidence of clowns or clown paraphernalia was found. While some of these reports have been harmless, others reports have been more suspicious. In one instance, a woman reported a person in a clown costume was standing in her backyard and ran away as she took a picture. In one case, an individual had heard clanging chains and a banging noise at his front door. While other cases report a clown offering money or candy to children to follow the clown into the woods. On October 4, a 19-year-old man in a clown costume was arrested on the campus of South Dakota State University in Brookings for disorderly conduct. He was allegedly scaring students. On September 19, in Summitville, a 15-year-old boy was cut with a knife by a man in a clown mask. On September 28, at Carson-Newman University in Jefferson City, there were reportedly clown sightings on campus. On September 30, 2016 clown-themed threats were made against the high school in Temple. On October 3, 2016, a person dressed as a clown attacked a person at a housing complex at Texas State University. The victim said the alleged clown tried to grab her before she could pull away. The suspect then left in an unknown direction, according to University police. On October 5, 2016, the Tuloso-Midway Independent School District, which has about 4,000 students in its five schools, ordered a lockdown about 9 a.m. Wednesday after a bus driver and a monitor on the bus said they saw a clown sitting inside a vehicle near one of the schools, superintendent Sue Nelson said. On the morning of October 6, residents reported that a clown was knocking on doors of homes in a Manor neighborhood. An 18-year-old man was arrested, and police found a clown mask that belonged to the suspect. Houston Independent School District schools were placed on lockdown following clown-related threats posted on social media. On October 11, a Gainesville home was broken into by three clown-masked teenagers, and the homeowner was shot in the face and arm with a BB gun. A 13-year-old male and two 14-year-old males were arrested. On October 3, 2016, in St. George, Utah, a woman reported to police that while she was walking, someone dressed as a clown had exited a vehicle and chased her, though in follow-up interviews she clarified that the individual had merely stared at her without saying or doing anything to her. Also on October 3, 2016, near midnight in Provo, Utah, a woman reported to police that someone dressed as a clown ran across her suburban yard. On October 5, in Williston, a 15-year-old boy was arrested after being accused of wearing a clown mask and banging the classroom windows of Jean Garvin Youth and Family Services School. He faced charges of disorderly conduct and inducing panic. On September 25, 2016, the Augusta County Sheriff's Office was notified about sightings in the 100 block of River Bend Road in Fort Defiance. The call came from a resident who was fishing in the area with his two boys. According to the resident, he was approached by people fleeing the area after spotting several clowns in the nearby woods. As of October 27, 2016, no arrests have been made in this case. On October 6, 2016, a clown was reported on the campus of James Madison University. Students armed with pepper spray and baseball bats formed posses to hunt the clown down, although the sighting was later revealed to be a hoax. Virginia law prohibits anyone over 16 from wearing a mask to conceal one's identity. On October 3, several students at Rogers High School in Puyallup received text messages of a person dressed as a clown threatening to kill students at the school. A person reported that a person dressed as a clown was seen wielding a knife near the school campus on the following morning. On October 4, the school was put on lock down and police found two clown masks in the woods adjacent to the school. Two other Pierce County schools Emerald Ridge High School and Glacier View Junior High were closed down on October 4 due to threats. The case is being investigated by both the Pierce County Sheriff's Office and the FBI. In early October, a 14-year-old girl was arrested for phoning a clown-related threat to McKinley Middle School. In early October, in Fairmont, a 34-year-old man was arrested on a charge of assault after an incident was reported in which a man was wearing a clown mask, carrying a baseball bat, and chased four children, ages 6 to 11. On August 1, 2016, near the beginning of this spate of sightings, Wisconsin residents reported seeing Gags the Green Bay Clown. There has been speculation that this clown is related to an independent horror film due to premiere around Halloween. On October 7, 2016, a Menasha couple dressed up as clowns were arrested for child negligence for leaving their 4-year-old child alone at home while they were outside scaring people. In early October, creepy clowns were reported by citizens to be walking around mazes and taking selfies in Natrona County. In one example, threats of violence and the same image of a clown referred to a minimum of 24 schools in Arizona Valley's Phoenix Union and Glendale school districts. On Monday, September 26, around 1,500 of Marydale High School's students (nearly half of all students) did not attend after the first threats appeared on the Internet. On October 1, schools in Hamburg, Pennsylvania were locked down because of a clown threat on Facebook and Twitter by a group with the name "Aint Clownin Around." The message read "We will be at all High schools this friday to either kidnapp [sic] students or kill teachers going to they cars ...#WeNotClowninAround." In Philadelphia, threats against students and schools have been posted at social media sites, prompting the FBI and a terrorism task force to help police investigate. The exact nature of these threats has not been made public. Such threats on social media have also affected two grade schools in Alabama, Auburn University, Fairborn High School, Columbus, Ohio, some Las Vegas area schools, and many more around the country. Explanations include that some clown sightings were promotional stunts for Rob Zombie's 31 or Andrés Muschietti's 2017 film adaptation of Stephen King's novel It, both of which feature one or more characters dressed as clowns. Author and folklorist Benjamin Radford, who wrote the non-fiction book Bad Clowns, said that the craze could be an example of the "snowball effect", where rumor and legitimate concerns mix with the human penchant for a good story. The Verge dismissed the sightings as a case of mass hysteria, stating that a fear of clowns (which is common in children and adults) may be an underlying cause. Vox likewise claimed that "The Great Clown Panic of 2016 has been perpetuated by pretty much everyone except actual clowns." ^ "Creepy clown sightings reported in more communities in South Carolina". WJW (TV). Retrieved September 3, 2016. ^ Rogers, Katie (August 30, 2016). "Creepy Clown Sightings in South Carolina Cause a Frenzy". The New York Times. NYTimes.com. Retrieved September 3, 2016. ^ McGurty, Frank; Prentice, Chris. "Clown sightings spook South Carolina, perplex police". Yahoo!. Reuters. Retrieved September 3, 2016. ^ Harris, Chris. "South Carolina Police Chief to Creepy Clowns: 'The Clowning Around Needs to Stop'". People. People.com. Retrieved September 3, 2016. ^ Zuppello, Suzanne (2016-09-30). "'Killer Clowns': Inside the Terrifying Hoax Sweeping America". Rolling Stone. ^ Teague, Matthew (2016-10-05). "Clown sightings: the day it all began". The Guardian. ^ a b "Why I am a 'killer clown'". BBC. 25 October 2016. ^ a b "Pryor Woman Attacked By Woman, Two Men Wearing Clown Masks". KOTV-DT. 2016-10-16. ^ a b "Clown accused of attempting to kidnap child in Concord". WLS-TV. October 4, 2016. ^ a b "Teens arrested after multiple clown mask robberies". WCMH-TV. 2016-09-30. ^ a b Simpson, Connor. "Northampton Solves the Mystery of The Creepy Clown". Retrieved 21 October 2016. ^ News, A. B. C. (13 October 2014). "Mysterious Clowns Terrorizing California City". Retrieved 21 October 2016. ^ Reporter, David Moye; Post, The Huffington (24 July 2015). "Creepy Clown Menaces Chicago Cemetery". Retrieved 21 October 2016. ^ a b c Morris, J.D. (October 7, 2016). ""Creepy clown" threats lead to investigations in Sonoma County". Press Democrat. ^ a b ""Killer clown" craze hits Perth as masked man bursts from trees to terrify walker". The Courier. Retrieved 14 October 2016. ^ "Clown president: 'We don't want to scare people'". New Zealand Herald. 10 October 2016. ^ "Circus clown: Stop giving us a bad name". stuff.co.nz. ^ Vanessa Brown (11 October 2016). "How the creepy clown craze is killing the entertainment profession". New Zealand Herald. Retrieved 12 October 2016. ^ "McDonald's: Ronald McDonald keeping a lower profile". New Zealand Herald. 12 October 2016. ^ Patricia Greig. "Clown craze: It's going to peak, it's going to be here in New Zealand". NZ Herald. ^ Lee Moran (31 October 2016). "Creepy Clown Threat Prompts Spooked Floridians To Trick-Or-Treat While Armed". The Huffington Post. Retrieved 1 November 2016. ^ "Russian Embassy warns citizens about British 'clowns'... while locked in Syria stand-off with Boris Johnson". Mirror.co.uk. October 12, 2016. ^ "Police Warn Against Clowns Movement". Fiji Sun Online. ^ "Halloween clown outfits pulled from Kiwi hire shop shelves". 15 October 2016. Retrieved 21 October 2016 – via New Zealand Herald. ^ "Local elementary school banning clown costumes, masks". WHIO-TV. October 18, 2016. Retrieved October 18, 2016. ^ Pheifer, Pat (October 16, 2016). "Target pulls clown masks from stores and website due to 'crazy clown' scares". Star Tribune. ^ Walters, Joanna (2016-10-16). "Clown sightings: hysteria in the US reaches a fever pitch". The Guardian. ^ Wang, Amy B. (2016-10-17). "Target halts clown-mask sales amid creepy-clown hysteria". Chicago Tribune. ^ Jonathan MacInnis (October 28, 2016). "No laughing matter: N.B. village asks residents to ditch the clown costumes this Halloween". CTV News Atlantic. Retrieved 29 October 2016. ^ "Theme park staff told to take off clown costumes". The Times. 2016-10-17. ^ Rogers, Eryn (25 October 2016). "Clown purge rumor targets Greenville". wspa.com. ^ "Killer Clown Purge 2016: Where & When Will The Clowns Attack?". morningledger.com. 25 October 2016. ^ "Map of Killer Clowns Purge 2016: Which States Will Be Attacked?". 26 October 2016. ^ EndPlay (1 November 2016). "Victim recognizes teen during brutal attack by 20 people in 'The Purge,' clown masks". ^ Ober, Amanda (1 November 2016). "Man says he was random target of masked Halloween mob attack in East Orange County". ^ Amanda N'Duka (31 May 2017). "Tommy V Nabs Clown Epidemic Thriller 'Behind The Sightings'". Deadline Hollywood. Retrieved 1 June 2017. ^ John Squires (31 May 2017). "Scary Clown Film 'Behind The Sightings' is Ripped from the Headlines". Bloody Disgusting. Retrieved 1 June 2017. ^ Duggan, Adam (October 7, 2016). "Menacing clown sightings reported in Australia". 9 News. ^ "Clown 'purge' craze: Scary clown craze spreads to Australia, police warn it's no joke". dailytelegraph.com.au. October 7, 2016. ^ Jordanna Schriever (October 9, 2016). "Creepy clown terrorises two 12-year-old girls in Adelaide's CBD". The Advertiser. ^ "How the "epidemic" of macabre clowns left temporarily without work Ronald McDonald" (in Spanish). BBC. October 12, 2016. ^ Romero, Rebeca (October 18, 2016). "Sightings of evil clowns: marketing campaign or mass hysteria?". Teinteresa. ^ "Brazil's 'Good Clowns' Fight Back Against Creepy Clown Attackers". Sputnik News. October 23, 2016. ^ Paige Parsons (5 October 2016). "Suspect arrested after lockdown at Harry Ainlay High School, 'creepy clown' causes social media scare". edmontonjournal.com. Retrieved 6 October 2016. ^ Caley Ramsay (6 October 2016). "Alleged 'clowning' threat places northeast Edmonton school on alert". Global News. Retrieved 7 October 2016. ^ Juris Graney (6 October 2016). "Two youths charged after 'inciting violence' against staff, students at Edmonton schools". Edmonton Sun. Retrieved 7 October 2016. ^ Emily Mertz (7 October 2016). "3rd teen charged after threat made against Edmonton school on social media". Global News. Retrieved 7 October 2016. ^ Romero, Diego (October 6, 2016). "Two 'creepy clown' sightings in Fort Saskatchewan: RCMP". CTV News Edmonton. Fort Saskatchewan: Bell Media. Retrieved October 7, 2016. ^ Mertz, Emily (October 6, 2016). "Young man in clown mask identifies himself to Fort Saskatchewan RCMP". Corus Entertainment Inc. Global News Edmonton. ^ Mathew Silver (5 October 2016). "Calgary group ready to defend city from killer clowns". metronews.ca. Retrieved 6 October 2016. ^ "Creepy clowns: Social-media fuelled scare makes its way to B.C." vancouversun.com. 6 October 2016. ^ "Police called to 'creepy clown' complaint in central Newfoundland". Newfoundland Broadcasting Company, Ltd. NTV. October 5, 2016. Retrieved October 7, 2016. ^ "Beni Malone Fights Back Against 'Creepy Clown' Hysteria". Newcap Radio. VOCM (AM). October 6, 2016. Retrieved October 7, 2016. ^ Nicole Gnazdowsky (4 October 2016). "Stop clowning around: Halifax police say creepy clown sightings not 'wise thing to do'". metronews.ca. Retrieved 4 October 2016. ^ "Photo on Instagram showing clown outside Halifax high school draws police investigation". National Post. 4 October 2016. Retrieved 5 October 2016. ^ "Police respond to clown report at Halifax West High School". The Chronicle Herald. 4 October 2016. Retrieved 4 October 2016. ^ Jeff Lagerquist (1 October 2016). "'A nightmare coming true': Gangs of clowns terrorize N.S. drivers". CTVNews. Retrieved 4 October 2016. ^ "Man wearing creepy clown mask arrested in southwestern Nova Scotia". Global News. 6 October 2016. Retrieved 6 October 2016. ^ Sarah Rogers (2016-10-13). "Nunavut community reports creepy clown sightings". nunatsiaqonline.ca. ^ Chris Fox (5 October 2016). "Teen in clown costume chases students at west-end school: police". cp24.com. Retrieved 6 October 2016. ^ Courtney Greenberg (5 October 2016). "Group of clowns threaten, taunt TCDSB students". ctvnews.ca. Retrieved 6 October 2016. ^ nurun.com. "Clown threat sent to London high school students". lfpress.com. ^ Haley Ritchie (10 August 2016). "Police investigating after creepy clowns chase kids in Gatineau". metronews.ca. Retrieved 4 October 2016. ^ "Creepy Clown Sighting Caught On Camera – Quebec Canada 2016". YouTube. Retrieved 15 October 2016. ^ "As creepy clowns spread to Quebec, life gets tricky for working clowns". montrealgazette.com. 25 October 2016. Retrieved 31 October 2016. ^ "They're here: Murderers Clowns came to Chile". Concierto. October 12, 2016. ^ "Uhićen klaun u Varaždinu, mahao sjekirom i plašio prolaznike". index.hr. ^ Vijesti.hr. "U priču oko zlokobnih klaunova se uključio i ministar: 'Nema tolerancije ako građani strahuju!'". rtl.hr. ^ "Over 20 episoder med onde klovne: 22-årig mand skræmt med økse". DR. Retrieved 2016-10-17. ^ "Uhyggelig trend er nået til Danmark: Peter blev skræmt af klovn med økse". nyheder.tv2.dk (in Danish). 2016-10-13. Retrieved 2016-10-13. ^ "Politiets anbefaling: Det skal du gøre, hvis du møder skræmmende klovn". nyheder.tv2.dk (in Danish). 2016-10-17. Retrieved 2016-10-17. ^ Kerkelä, Lasse (18 October 2016). "Pelkoa herättänyt klovni-ilmiö levisi Suomeenkin – silminnäkijät kertoneet tapauksista eri puolilla maata". Helsingin Sanomat (in Finnish). Retrieved 19 October 2016. ^ "Wesel: Erster Grusel-Clown bedroht Passanten in Deutschland – FOCUS Online". Focus.de (in German). Retrieved 2016-10-20. ^ Chu, Joyce (2016-10-21). "Creepy Clown Scare Spreads to Germany". Jewish Political News and Updates. Retrieved 2016-10-21. ^ "Grusel-Clown muss nach Messerstich notoperiert werden". faz.net (in German). Retrieved 2016-10-25. ^ Roack, Nick (October 29, 2016). "Germany announces 'zero tolerance' policy against creepy clowns ahead of Halloween". The Washington Post. Retrieved October 29, 2016. ^ a b McSorley, Anita. "Gardai warning as terrifying craze of 'creepy clowns' sweeping Ireland – Irish Mirror Online". Irishmirror.ie. Retrieved 2016-10-20. ^ a b c O'Faherty, Jane (10 October 2016). "Halloween event bosses apologise after 'creepy' clowns got lost and terrified students". Irish Independent. Retrieved 11 October 2016. ^ Brennan, Colin (2016-10-13). "'Young girl terrified' after Creepy Clown 'armed with axe breaks' into Kildare home, reports – Irish Mirror Online". Irishmirror.ie. Retrieved 2016-10-20. ^ Lyne, Laura. "Warnings after terrifying craze of clowns jumping out of bushes to scare passers-by has spread to Ireland after sweeping America – Irish Mirror Online". Irishmirror.ie. Retrieved 2016-10-20. ^ "Dundalk Gardaí issue warning over 'Killer Clown' craze". dundalkdemocrat.ie. Retrieved 31 October 2016. ^ "Alertan sobre "payasos" delincuentes en Monterrey" [Warn of "clowns" criminals in Monterrey] (in Spanish). Hoy. October 5, 2016. ^ "Warn of 'clowns assailants' in Monterrey" (in Spanish). Agencies. October 5, 2016. Retrieved October 6, 2016. ^ "Matan a dos payasos que asustaban a mujeres y niños en Ecatepec" [Clowns kill two frightened women and children in Ecatepec] (in Spanish). Posta. October 7, 2016. ^ "Mueren baleados dos hombres disfrazados de payasos". Prensa Libre. Retrieved 2016-10-16. ^ "Killer clown craze arrives in Mexico". mexiconewsdaily.com. October 11, 2016. ^ Nikki Preston (9 October 2016). "Paranoia rising over scary clown epidemic in NZ". New Zealand Herald. ^ "Creepy clown caught on camera at university". New Zealand Herald. October 2016. ^ "Clown 'scaring passers-by' arrested in Dunedin's student quarter". October 2016. ^ "Axe-wielding clown threatens to kill Dunedin teen". October 2016. ^ Phillipa Yalden (8 October 2016). "'Clown' attackers assault woman walking home in Hamilton". Stuff. Retrieved 11 October 2016. ^ PHILLIPA YALDEN, TE AHUA MAITLAND (October 2016). "Clown steals box of beer in Hamilton liquor store theft". Stuff. ^ "Police urge calm as Porirua clown sighting spreads panic". Dominion Post. October 5, 2016. ^ "Clown mask worn by suspected Timaru tyre slasher". Timaru Herald. October 13, 2016. ^ "Eerste 'horrorclown' gesignaleerd in Nederland". Retrieved 11 October 2016. ^ "Nu ook in Nederland? Politie Almere waarschuwt voor 'killer clowns'". Retrieved 11 October 2016. ^ Pieters, Janene (October 17, 2016). "KILLER CLOWN ARRESTED IN ROERMOND". NL Times. ^ "Creepy clown craze puts Norwegians on edge". The Local. October 12, 2016. ^ Hale, Erin (November 3, 2016). "Creepy Clowns Arrive In Asia As Singapore Prank Ends In Hours Of Police Detention". Forbes. ^ "Diabolical clowns fad has come to Spain". Telecinco. October 16, 2016. ^ "Diabolical clowns come to Spain's streets". 20 minutos. October 24, 2016. ^ "Two evil clowns assailed a girl in Fuenlabrada". Madridiario. October 28, 2016. ^ Ullrich, Pär (October 13, 2016). "7 frågor och svar om clownerna i Sverige". Expressen (in Swedish). Archived from the original on 14 October 2016. ^ "Grusel-Clowns - jetzt in Schweden: Junger Mann niedergestochen". RT Deutsch. October 14, 2016. ^ "Armed clowns threaten woman in Sweden". The Local. October 13, 2016. ^ "Teen injured in clown craze attack in Sweden". The Local. October 14, 2016. ^ "Knivskars av man i clownmask – ingen gripen" (in Swedish). Omni. October 14, 2016. ^ Lovejoy, Bess (2016-10-15). "What Do the Scary Clowns Want?". The New York Times. ^ "Sweden police overwhelmed by clown emergency calls". 15 October 2016. Retrieved 21 October 2016. ^ "'Scary clown' craze hits streets of Zurich". The Local. October 24, 2016. ^ Porter, Tom (4 October 2016). "Clownageddon comes to the UK as Newcastle schoolchildren targeted by 'creepy clown' attacks". International Business Times UK. Retrieved 6 October 2016. ^ Graham, Hannah (4 October 2016). "Children 'distressed' by 'pranksters' in clown costumes". chroniclelive.co.uk. Retrieved 6 October 2016. ^ Graham, Hannah (4 October 2016). "Clown prank: teenager arrested for allegedly carrying a "bladed article"". chroniclelive.co.uk. Retrieved 6 October 2016. ^ "Knife-wielding 'killer clown' pursues Durham schoolchildren". The Guardian. Press Association. 7 October 2016. ^ Shaw, Neil (October 8, 2016). "Creepy clown armed with hammer confronts man – then gets chased down street with beer bottle". Mirror.co.uk. ^ Long, Jessica. "Man dressed as clown arrested in Norwich after chasing woman through Eaton Park". edp24.co.uk. ^ Morgan, Nina. "Herts Police issues warning over 'frightening' clowns". Welwyn Hatfield Times. ^ Armstrong, Jeremy (2016-10-13). "Killer clowns leave children so terrified they're calling Childline in their hundreds – Irish Mirror Online". Irish Mirror. Retrieved 2016-10-20. ^ "Boy injured in clown craze attack in Rotherham". 12 October 2016 – via www.bbc.co.uk. ^ "'Knife-wielding clown' leaves man with serious hand injuries". 12 October 2016 – via www.bbc.co.uk. ^ Christodoulou, Holly. "CLOWNING AROUND: A dad who said he was 'disabled for life' by a killer clown has been slapped with a fine for making it up". The Sun. ^ "Clown sightings in the UK – where have they been spotted and where has the trend come from". The Sun. October 2016. ^ "Clown creeps warned over conduct after reports of intimidation in Livingston". Daily Record. 12 October 2016. Retrieved 14 October 2016. ^ "X Factor star 'chased by "killer clown" outside Aberdeen nightclub'". The Press and Journal. 10 October 2016. Retrieved 14 October 2016. ^ "'Killer clown' craze arrives in Scotland". The Scotsman. 11 October 2016. Retrieved 14 October 2016. ^ Jones, Dion (October 6, 2016). "Terrified boy films creepy clown spooking drivers near children's play centre in quiet Welsh town". Mirror.co.uk. ^ "Boy injured after being chased by 'stone-throwing' clown as police warn over 'killer clown' incidents". ^ "'Clown' unmasked by police turns out to be a wanted man". 10 October 2016. ^ Bolter, Abby (11 October 2016). "Four clowns carrying a 'sledgehammer' approached girl in a park". ^ Silk, Huw (10 October 2016). "Clowns 'running through gardens and peering through windows'". ^ "'Killer Clowns' Have Been Spotted In Belfast & People Are (Quite Rightly) Freaking Out". Belfastvibe.com. Retrieved 2016-10-20. ^ "'Killer clown' warning as craze hits Northern Ireland". BBC. 7 October 2016. ^ Daire Courtney. "Children threatened with knife by 'killer clown' in Antrim park". Independent.ie. Retrieved 2016-10-20. ^ a b Kilpatrick, Chris (2016-10-12). "Irish school goes into lockdown after sinister threat online from killer clowns – Irish Mirror Online". Irishmirror.ie. Retrieved 2016-10-20. ^ Suzanne McGonagle. "Video: PSNI issue 'killer clown' warning to the public". The Irish News. Retrieved 2016-10-20. ^ Kilpatrick, Chris (2016-10-14). "Killer clowns terror sparks surge in counselling calls to NSPCC kids' charity". Belfast Live. Retrieved 2016-10-20. ^ "Northern Ireland school bans killer clowns from Halloween party". belfasttelegraph.co.uk. Retrieved 31 October 2016. ^ Kilpatrick, Chris (20 October 2016). "Killer clowns accused of common assault in Northern Ireland estate". belfastlive.co.uk. Retrieved 31 October 2016. ^ Dwilson, Stephanie Dube (1 October 2016). "Clown Sightings List: Which States Have Reported Threatening Clowns?". ^ Bell, Kim. "As reports trickle in of creepy clown sightings, Pevely police worry about vigilantes". Retrieved 2016-10-01. ^ "At least 9 'clown' arrests in Alabama". al.com. ^ DeGrave, Sam (October 11, 2016). "Creepy clown sightings reported in Juneau". Juneau Empire. ^ "Bentonville police arrest scary clown". 5 October 2016. ^ "Clowns Threaten Fairfield, Oakland Schools on Twitter". NBC Bay Area. October 4, 2016. Retrieved October 5, 2016. ^ "Threats of 'creepy clowns' plague Sacramento-area schools". KCRA. October 4, 2016. ^ a b "TEEN ARRESTED FOR 'FONTANA KILLER CLOWN' SCARE ON SOCIAL MEDIA". WLS-TV. October 5, 2016. ^ "'Creepy clowns' come to SoCal, police warn residents". FOX LA. ^ Salvo, Christina (October 5, 2016). "2 DRESSED AS CLOWNS CREEP UP ON SAN PEDRO ELEMENTARY SCHOOL WORKERS". WLS-TV. ^ Cruz, Glory Rose (2016-10-06). "Students react to recent clown sighting on campus". The Sundial. Retrieved 2016-10-07. ^ "'Creepy clown' sightings hit Orange County; two reported in Huntington Beach". OC Register. October 6, 2016. ^ Heise, Sarah (October 7, 2016). "Marysville police make 'clown' arrest after threats". KCRA. ^ Cabanatuan, Michael (October 9, 2016). "Salinas boy, 11, cited after admitting making creepy clown threats". San Francisco Chronicle. ^ Rodriguez, Joe Fitzgerald (October 10, 2016). "'Creepy clown' spotted on Muni bus amid nationwide craze". The San Francisco Examiner. ^ De Guzman, Diana (October 24, 2016). "Reports: 3 men with 'creepy clown' masks, gun found by security at SF's Westfield mall". San Francisco Chronicle. ^ a b Contreras, Oscar; Hernandez, Lance (October 1, 2016). "Where creepy clowns have been reported across Colorado". The Denver Channel. ^ Dawidowicz, Christina (October 7, 2016). "Victim describes creepy clown attack in Colorado Springs". FOX21 News. Retrieved October 8, 2016. ^ Macy Corica (October 4, 2016). "Naugatuck police arrest 2 girls for clown social media posts". WTNH Connecticut News. Retrieved 8 October 2016. ^ "2 Arrested in Connection With Clown Prank Resulting in Lockdown of Connecticut School". October 13, 2016. ^ Campbell, Julien Novog-Desrayaud, Rob Polansky, Evan White, Matt. "More CT schools receive threats involving clowns; 2 girls charged in Naugatuck". Retrieved 2017-08-04. ^ Naples, Matt McFarland, Kaitlyn. "Meriden officials continue to investigate creepy clown sightings". Retrieved 2017-08-04. ^ "Clown sightings in Delaware freak out moms, students". October 3, 2016. ^ "2 Delaware teens arrested for threat of clown attack, bombs". October 5, 2016. ^ a b c d Ashley May (28 September 2016). "Serious or just a sick joke? What we know about creepy clown reports". lohud.com. Retrieved 7 October 2016. ^ "Clown scares lock down village of Florida schools". News 12 Networks (Hudson Valley channel). October 4, 2016. ^ Michael Randall (October 4, 2016). "Local school locked down after reports of clown inside the school". Times Herald-Record. ^ Zach Dennis (October 5, 2016). "Deputies: 12-year-old arrested for clown threats to Florida schools". The Palm Beach Post. ^ "Deputies: 12-year-old arrested for clown threats to Florida..." Retrieved 2016-10-07. ^ "2 men dressed as clowns chase people around north Melbourne, police say". WESH. October 27, 2016. ^ Cherney, Elyssa (October 26, 2016). "Lake deputies arrest armed felon with clown mask". Orlando Sentinel. ^ EndPlay (1 November 2016). "Some Florida parents arm themselves against 'creepy clowns' on Halloween". ^ "Victim recognizes teen during brutal attack by 20 people in 'The Purge,' clown masks". WFTV. November 1, 2016. ^ "LaGrange Police – Timeline | Facebook". www.facebook.com. Retrieved 2016-10-01. ^ Kristen Reed; Kaitlyn Ross (September 20, 2016). "Ga. cops make 'terroristic threat' arrests after clown post". TEGNA. Retrieved 2016-10-01. ^ Madison Cavalchire (12 September 2016). "Creepy clowns in Dublin?". ^ Rick Daysog (7 October 2016). "Clown hysteria hits Hawaii, prompting security fears". hawaiinewsnow.com. Retrieved 12 October 2016. ^ Bryce, Debbie (October 9, 2016). "Creepy clown craze infecting East Idaho". Idaho State Journal. ^ "Waukegan Police investigating after 3 clowns with knife and gun taunt children during recess". FOX32 Chicago. October 4, 2016. Retrieved October 6, 2016. ^ "Cops: Clown sighting at Waukegan elementary was fake". ^ Grimes, Bill (October 5, 2016). "Man dressed as clown arrested in Altamont". Effingham Daily News. ^ "Man dressed as clown arrested for assault in Urbandale". Des Moines Register. ^ "Clown report was a hoax". Parsons Sun. 2016-10-03. ^ "Lurking clown arrested in Kentucky woods near apartment block as US 'creepy clown' fears spread". The Telegraph. 23 September 2016. ^ "Police investigating report of a woman attacked by man in clown mask in Winchester, Ky". WDRB 41 Louisville. 1 October 2016. ^ Hilary Hanson (5 October 2016). "Man Allegedly Fires AR-15 To Scare Dogwalker He Mistook For Clown". The Huffington Post. Retrieved 8 October 2016. ^ "Man in Vernon Parish arrested for wearing clown mask, holding gun inside car". KLFY. October 17, 2016. ^ Elle Ousfar. "Police to clown: 'We will handle you accordingly'". TEGNA. Retrieved 2016-10-04. ^ Joey (October 5, 2016). "Maine's Clown Hysteria Reaches New Heights; Sightings In Kennebunk, Gorham, and Standish Reported". wcyy.com. ^ "Student Charged in Md. School Threats Case". NBC Washington. 3 October 2016. ^ Belt, Deb (October 6, 2016). "4 Boys Charged for 'Creepy Clown' Threats on Social Media in Montgomery Co". Patch Media. ^ "Reported Creepy Clown Sightings At Mass. Schools Prompt Police Response". cbslocal.com. ^ "Police Beat / 9-29-16". hastingsbanner.com. Retrieved 2016-10-14. ^ "Clown reportedly startles student / 10-6-16". hastingsbanner.com. Retrieved 2016-10-14. ^ a b c d e f g h Candice Williams (5 October 2016). "Police probe alleged clown attacks in Sterling Heights". detroitnews.com. Retrieved 6 October 2016. ^ a b c "Troy Police Post Stern Message To Clowns Amid Sightings, Scares Nationwide". cbslocal.com. October 4, 2016. ^ Christina Hall (October 7, 2016). "Police: 2 'idiots' dressed as 'creepy clowns,' arrested after terrorizing teens". USA Today. ^ "'Morons' in clown costumes arrested for trying to scare teens in Roseville". WHBQ-TV. 2016-10-07. ^ Bob Shaw (Oct 5, 2016). "Creepy clown phenomenon hitting Minnesota; no truth to sightings, officials say". duluthnewstribune.com. Retrieved 8 October 2016. ^ a b c May, Ashley (September 30, 2016). "What We Know About Creepy Clown Reports". ^ "Clown craze causing concerns". 3 October 2016. ^ "Montana police cite student over clown threat statement". Associated Press. October 13, 2016. ^ Manna, Nichole (October 6, 2016). "Clowns spotted in Lincoln; teen clowns arrested in Grand Island". Journal Star. Retrieved October 6, 2016. ^ "Clown carrying a plastic machete in Parsippany was a juvenile, cops say". NJ.com. Retrieved 2016-10-13. ^ "Clown carrying plastic machete spotted in Parsippany, cops say". NJ.com. Retrieved 2016-10-13. ^ Vanessa Murdock (September 28, 2016). "New Jersey Child Says He Was Chased By Creepy Clown With Sword". CBS. ^ Suzanne Russell (October 3, 2016). "Creepy clowns spotted in Bound Brook, Spotswood". My Central Jersey. ^ Suzanne Russell (October 4, 2016). "Latest 'creepy clown' sighting no laughing matter". My Central Jersey. ^ Dougherty, Kristina. "Officials: Students 'Terrorized' By Teen Running Around In Clown Mask". ^ Cope, Cheyenne (October 4, 2016). "Hobbs Police receiving calls about clown sightings". KRQE. Retrieved October 7, 2016. ^ a b "3 juveniles in Albuquerque caught with clown masks, handgun". Associated Press. October 9, 2016. ^ a b "Creepy Clown Sightings Reported In and Clifton Park and Brentwood, North Babylon". September 30, 2016. Retrieved 2016-10-01. ^ Dwyer, Kate (September 28, 2016). "Two Schools Just Went on Lockdown Because of 'Clown-Related Threats'". Teen Vogue. ^ "Man in Clown Garb Arrested in Knife Subway Menacing of Teenage Boy". NBC New York. October 13, 2016. ^ "Rockland County Clown Outbreak – Timeline – Facebook". facebook.com. ^ "St. Bonaventure University Officials Urge Students to Not Attack Clowns". Time Warner Cable News. 5 October 2016. ^ "Man with machete chases after clown spotted near woods in Greensboro, North Carolina". nydailynews.com. 7 September 2016. ^ Chase, Ken (October 10, 2016). "Police searching for clown with machete in Rolla". WDAZ. ^ a b c d T.J. Parker; Rose-Ann Aragon; WCPO Staff (30 September 2016). "Clown attack forces several schools in Ohio to cancel Friday's classes". ABC. ^ "School district shuts down after creepy clown attack". WDAF-TV. 2016-09-30. ^ "More arrests in Ohio amid growing rash of clown-related threats". CBS news. 2 October 2016. ^ "Can you ID pipe-wielding suspects in masks who rob Speedway?". Dayton Daily News. October 4, 2016. Retrieved October 5, 2016. ^ Kelley, Jeremy P. (September 30, 2016). "Clown chaos leads to school closings, felony arrest". Dayton Daily News. Retrieved October 5, 2016. ^ ""They're going to get hurt," Moore residents confront 'creepy clowns' lurking near park". KFOR.com. 2016-10-08. Retrieved 2016-10-08. ^ Stogsdill, Sheila (October 31, 2016). "Oklahoma woman could face charges over clown attack report". NewsOK.com. Retrieved October 31, 2016. ^ "Woman says she was accosted by clown in downtown Portland". Oregon Live. September 30, 2016. ^ "Scary clown arrest made in southern Oregon". KGW. October 5, 2016. ^ "Man wearing clown mask, boxing gloves threatens assistant principal outside school". KGW. October 6, 2016. ^ "Strange clown sightings by State College YMCA". 18 September 2016. ^ "Pa. clown sightings: Police responding to another possible incident". 23 September 2016. ^ "Clown sightings reach York College". Retrieved 2016-10-01. ^ "Creepy Clown Sightings Reported in Erie". 4 October 2016. ^ "Police hunt for 'killer clown' who stabbed teenage boy to death in Pennsylvania". 31 October 2016. ^ "Man arrested in stabbing death of boy with clown mask". 31 October 2016. ^ "Recent Threats to Pennsylvania Schools" (PDF). Pennsylvania State Police. October 3, 2016. ^ Menno, Video by Christian. "Video: Creepy clown phenomenon hurting Abington clown's business". Bucks County Courier Times. Retrieved 2016-10-11. ^ "Penn State students flood downtown, campus over clowns". Centre Daily. 4 October 2016. ^ "Penn State Creepy Clowns: 5 Fast Facts You Need to Know". Heavy. 4 October 2016. ^ "They argue that clown stalks residence in Guaynabo" (in Spanish). Telemundo. October 9, 2016. ^ Perez, Maribel Hernandez (October 17, 2016). "Report new complaint clown thief in Rio Piedras". ^ "'Like War of the Worlds': R.I. police grapple with 'creepy clown' hysteria". Providence Journal. 4 October 2016. ^ "Pawtucket teenager arrested, charged with clown threats against school". Providence Journal. 7 October 2016. ^ "Clown threat ruins recess for students at Coventry elementary school". Providence Journal. 7 October 2016. ^ "Creepy details released in South Carolina clown sightings". Retrieved 2016-10-07. ^ ""This is serious:" Creepy clown sightings reported in second community in South Carolina". Fox 6. 1 September 2016. ^ "Creepy Clown Sightings in South Carolina Cause a Frenzy". New York Times. 30 August 2016. ^ "Man dressed in clown costume arrested on SDSU campus". KSFY. October 7, 2016. ^ "Tennessee teen says he was attacked by a clown with a knife". Associated Press. September 21, 2016. ^ Tristan Thomas [@tnttristan] (28 Sep 2016). "Carson-Newman of all places has clowns on the campus..." (Tweet) – via Twitter. ^ Dominguez, Crystal; McKeon, Deborah (2016-09-30). "Temple clown threats investigated". Temple Daily Telegram. ^ TEGNA. "Texas State student attacked by man dressed as clown, school says". KVUE. Retrieved 2016-10-07. ^ Chan, Melissa. "Texas School District on Lockdown After 2 Clown Sightings". TIME.com. Retrieved 2016-10-07. ^ Ricke, Claire; Rangel, Leslie (October 6, 2016). "Masked clown arrested in Manor". KXAN. ^ a b Axford, Will (October 13, 2016). "Teenagers who wore clown masks during burglary, shooting arrested". Houston Chronicle. ^ Hanson, Kurt (2016-10-04). "One confirmed clown sighting in Provo among dozens of concerned reports". The Daily Herald (Utah). ^ McKend, Eva (October 5, 2016). "Robocalls released after creepy clown panics students, staff at Vt. school". WCAX. ^ Mittchell, Michelle L. "Clown sightings grow in Virginia, police urge care". The News Virginian. ^ http://www.facebook.com/TReesShapiro. "Scary clown rumors, threats feed hysteria, leading to school lockdowns, arrests". Washington Post. ^ Stewart, Caleb. "JMU students join together to search for on-campus clown that turns out to be a hoax". ^ "Sheriff warns of possible clown sightings in county". Retrieved 2016-10-01. ^ Robertson, Kipp (October 4, 2016). "Puyallup school locked down after reports of knife-wielding clowns". mynorthwest.com. ^ "Teen girl arrested for making clown-related phone threats against DC middle school". FOX5DC. October 7, 2016. ^ "WV man wearing clown mask chases kids with baseball bat". Associated Press. October 4, 2016. ^ Roberts, Rhonda; Matesic, Emily (October 10, 2016). "Police: Menasha couple arrested for Child Neglect after clown prank". WBAY. Retrieved October 11, 2016. ^ Roth, Justin (October 12, 2016). "Creepy clown sightings impact Wyoming corn maze". KGWN. Retrieved October 26, 2016. ^ a b "Thousands of students skip class after clown threats". ABC News. 28 September 2016. ^ Michael Yoder (1 October 2016). "Hamburg schools were on lockdown due to clown threat". Reading Eagle. ^ Jeannette Reyes (3 October 2016). "PHILADELPHIA POLICE: GIRL,13, MADE 'CLOWN THREATS' TOWARD SCHOOLS". 6 ABC. ^ a b Aleister (September 21, 2016). "Police Called to Auburn University Over Clown Sightings". Legalinsurrection.com. Retrieved 2016-10-04. ^ "More arrests in Ohio amid growing rash of clown-related threats". CBS News. October 2, 2016. Retrieved 2016-10-04. ^ "Rumored Clown Threats Rile Some Las Vegas Students | KXNT 840 AM". CBS Las Vegas. Retrieved 2016-10-04. ^ Ben Guarino (September 7, 2016). "Clown sightings have spread to North Carolina. Now police are concerned about creepy copycats". The Washington Post. Retrieved 6 October 2016. ^ "South Carolina clown sightings could be part of film marketing stunt". The Guardian. Reuters. 4 September 2016. ^ AJ Willingham (5 October 2016). "What's with all the clowns everywhere? 6 legit possibilities". CNN. Retrieved 6 October 2016. ^ Angela Chen (7 October 2016). "The 2016 clown panic: 10 questions asked and answered". The Verge. Retrieved 1 November 2016. ^ Aja Romano (12 October 2016). "The great clown panic of 2016 is a hoax. But the terrifying side of clowns is real". Vox. Retrieved 3 November 2016.